Live blog: Trump hides from Megyn Kelly, behind veterans. 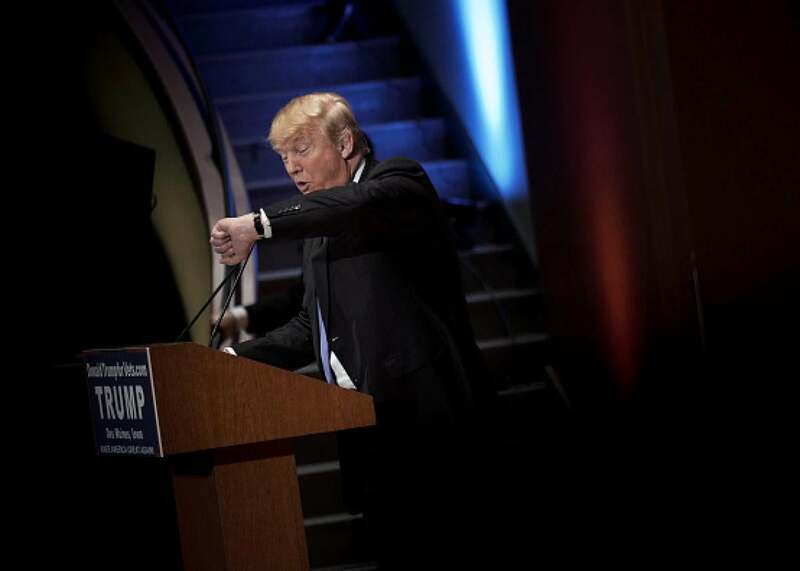 Donald Trump checks his watch during his fun, little non-debate rally. 10:20 p.m. ET: The Trump rally to restore attention to himself while avoiding having to face questions from “journalists” and “campaign rivals” has ended. Trump announced that the total contributions ultimately topped $6 million. However much was raised, one thing is clear: If you watched the GOP debate tonight, your time was less wasted, and if you spent the night watching the “Forensic Files” marathon, your time was better spent still. God bless America, god bless the Republican primaries, and good night. 10:10 p.m. ET: While the major networks have decided to abandon ship, I’m still here. Below is a livestream of the event, which was showing veterans and Trump supporters talk about life as veterans and Trump supporters. “That’s the best middle finger that you can give to the Taliban, is to live well and live awesome,” veteran John Wayne, who lost his leg in combat, said in a plea to fellow veterans to take care of their mental health and prevent suicides. This is a better message than anything that Donald Trump has ever said in his life. … And CNN wasn’t showing it… And the second that it ended and Trump came back on stage, CNN back to the event and off of their talking heads. … And when he went off the stage again… they cut away again. Good times. 9:40 p.m. ET: Another great Trump line about his decision to skip the Fox News debate from earlier in the evening: “I’m not going to do the debate—out of respect for myself, I’m not going to do it, it’d just be wrong.” It’s true that Trump’s entire life up until now screams dignity and self-respect, and he wouldn’t want to betray those values. MSNBC’s Rachel Maddow rightfully noted that this thing quickly turned into a Donald Trump stump speech and she smartly turned the ridiculousness off of her show. Trump stump speeches are actually still kind of amusing, but why they should deserve primetime coverage from major networks (or live blogs) is kind of a mystery. CNN has also pulled the plug on broadcasting this Trump thing, perhaps also realizing that we’d all been duped into believing he’d be saying something new when the whole point of tonight was for him to avoid saying something new. You live, you learn I guess! 9:30 p.m. ET: Trump boasts that he raised more than $5 million for veterans with this event—which if so, not bad!—and then lists the names of some of his donors. “Carl gave $500,000… Richard, a great builder in New York, gave $100,000… Donald Trump, another great builder in New York… gave $1 million.” You know lots of charitable donations—especially donations to one’s own organization, which is apparently where this money is going—are done anonymously, right? Trump also opened with one of the oddest Trump brags (about the superiority of his event to the Fox News debate) ever: “We have more cameras than they do, and that’s by quite a bit. And you know what, that’s really in honor of our vets.” Yes. In honor of our vets. … ? Should I do the #GOPdebate? Some leading veterans groups have said they would reject money raised by the Trump event and others denounced Trump for using veterans as “political props,” while one liberal veterans group accused Trump of hiding “from Megyn Kelly behind us.” (Trump told CNN on Thursday that he didn’t ask for Kelly to be removed as a debate moderator and that he was skipping the debate because of a snarky public relations statement Fox News put out about Trump threatening to pull out of the debate). While Trump’s motivations may be difficult to decipher—like a Donald Trump lawsuit, or a Sarah Palin endorsement—Trump is probably right about one thing: his event will likely be more entertaining than the Trumpless Republican debate! As a service to the more sober-minded people who might want to watch the actual debate and skip the Trump sideshow, Slate will be live blogging the completely benevolent, in no way ulterior motivated event as it happens.